Martin Stokes is a likable 17-year-old teenager who gets locked up in one of the nation’s most notoriously violent jails for “steering” (telling an undercover officer where to buy drugs) and is sent to NYC’s Rikers Island. Due to the terrible backlog of the city’s criminal justice system and his family’s inability to pay bail, he is forced to spend several months in custody until his case comes up and is heard by the judge. To make his situation worse, he becomes an innocent bystander during a scuffle between two other inmates and gets slashed on the face, physically scarring him. Martin is eventually transferred to an area where he is forced to go to school, and it is here when the real action of the story begins. 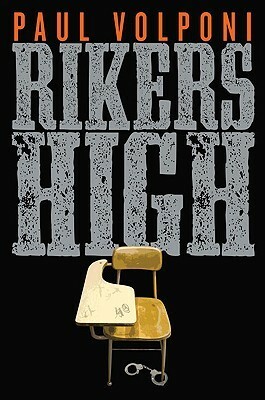 Be warned though, this book is filled with tons of “lock-up” slang that only those who have spent some time in a NY state correctional facility would understand. Even though the author does a decent job of explaining the lingo (a blurb on the back of the book says that he was a teacher on Rikers Island for several years), it still makes an awkward narrative. Riot officers who break up fights in housing units are “turtles,” solitary confinement is “the bing,” the dorms where youth are held are known as the “Sprung,” and members of violent gang crews are referred to as “doldiers” (a combination of the words ‘dummy’ and ‘soldiers’), and so on. Even though you understand Martin’s plight, his character and everyone else’s in this book was really thin and undeveloped. Part of this may have actually been intentional, due to the fact that we as a society tend to view all prisoners as the worst of the worst, the literal “throwaways” of society. The problem though is that even though this is the case, it’s just not enough to help you care more about what’s going on with the characters here. It’s also woefully unrealistic: Martin, a young black male, serves his time, learns his lesson, goes back home and moves on. This is usually not the case in real life. As we all know, many young black men with a felony on their criminal record are more likely to eventually return to jail: mostly due to factors such as a lack of resources, low employment prospects, poor quality education, etc. Prison is a giant revolving door, and few manage to break this destructive cycle. I would think that the author would use this book to make a statement on the effed-up state of the criminal justice system, but I digress. I do recommend this book for YA readers, specifically for teenage boys, who we all know are notoriously hard to engage in reading. It’s a fair cautionary tale, and even though I didn’t like it, they will.